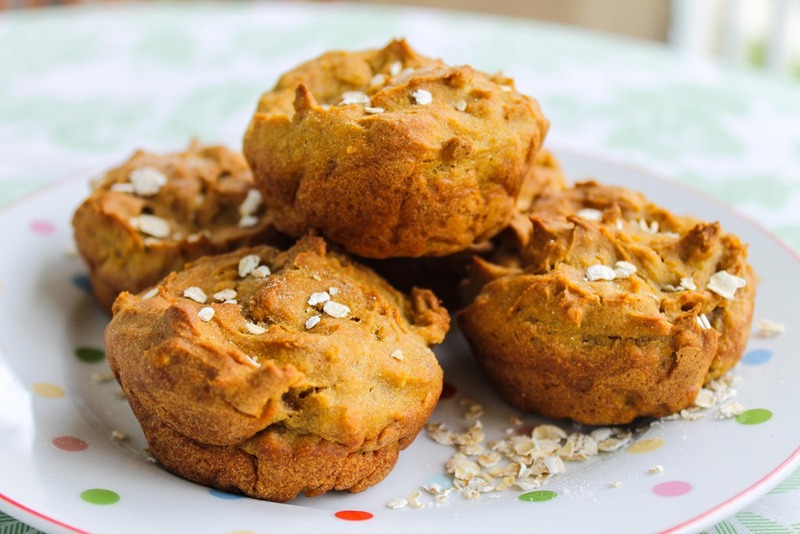 Making this dog muffin recipe is a wonderful way to take advantage of all the leftovers from the season's crop of winter squash. Butternut squash was used for this recipe (because it's wonderful ad delicious and oh so very versatile), but you can easily substitute acorn or spaghetti squash, to name just a few of the many available and healthy winter squashes. Winter squash is low in calories and a good source of fiber, which makes it a good pick for those dogs watching their wasteline. All dogs will appreciate the vitamin A, vitamin C, potassium, folate, omega 3 fatty acids and vitamins B1, B3, B5 & B6 in the squashes. Whisk together the oats, flour, cinnamon and ginger. Peel the squash and cut into 1 inch cubes. Place squash in a microwave safe bowl and add 1/8 cup of water. Microwave on high at one minute intervals until tender. After each minute, stir and test the softness of the squash. Once the squash is tender, drain the excess liquid. Place the squash, egg, oil and milk into a blender. Blend into a smooth puree, stirring when needed to keep the mixture moving. Make a well in the dry ingredients and pour in the squash mixture. Spray a mini muffin pan with non-stick cooking spray with flour. Using a tablespoon sized cookie scooper, scoop generous amounts into each muffin cup. Turn off the oven and let the muffins cool. Storing - This dog muffin recipe will keep in the fridge for about two weeks. You can freeze them for later enjoyment for up to 6 months. To decorate, let them thaw, or come to room temperature first. Yield - Using a mini muffin pan, you'll be able to turn out 24 little muffins. When Planning Your Garden Keep This in Mind…. A healthy dog is a beautiful dog!